Numbers released by the Bureau of Labor Statistics this morning show the overall unemployment rate ticked up to 7.6% from 7.5% a month earlier. To be sure, there was some good news behind the higher rate: Employers added 175,000 workers in May, up from 149,000 in April. The consensus among investors and economists is that the May jobs report is a plus for the economy, in part because the slightly higher unemployment rate will likely insure that the Federal Reserve continues its $85-billion-a-month bond-buying stimulus. U.S. employers added 175,000 jobs in May, the Labor Department reported, slightly topping economists' expectations. Investors took the report as a signal the economy is growing, but probably not by enough to prompt the Federal Reserve to quickly dial back on its bond buying. But unemployment ticked up by one-tenth of a percentage point to 7.6%. April's job-growth figure was revised downward. Conclusion: an unemployment rate that is moving slower than expected towards the Fed's 6.5% target will prompt the Fed to continue its asset purchases. 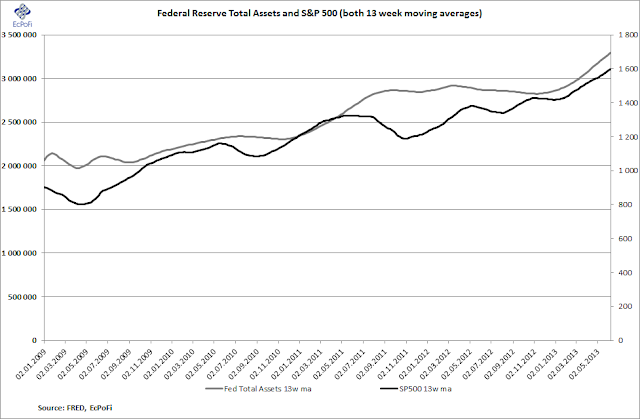 And low interest rates and an expanding Fed balance sheet is good news for stocks (e.g. see here). How is that for unsound "economics" or faulty politics when THE fundamental driver of the stock market is money printing and not real economic progress? The DJIA today rose 1.38% while the S&P 500 was up 1.28%.